I have indicated before that it is dangerous to be obsessed with “power generation” in your martial art; there is so much more, particularly if your approach is oriented towards civilian defence. You don’t want to get hit, for starters. To do that you need not only evasion but “blocking” (deflection). You need a good foundation in terms of grounding and movement – in particular movement that serves as a platform for your evasion and deflection. Of course, you also need skills relating to grappling – whether stand-up or on the ground. If you want to hit harder, you have to move your mass faster. There are glosses on that (as I’ve detailed in my articles “Kime: soul of the karate punch” and "Telegraphing vs. staged activation") but the above formula, in essence sums it up. So when I see people basing their art around “power generation” I start to become suspicious. I become doubly suspicious when their means of “power generation” focuses on one small variable in the scheme of making you hit “harder” – a variable that then proceeds to overwhelm the entire art. I’ve mentioned before that I’m not a fan of “koshi” – the pre-loading of hips on every single movement in a kata/form. Ostensibly this is done so as to maximise “power”. What it does, is it ignores the multitude of other ways in which your body, moving as an integrated whole in a dynamic context, imparts greater force. As Marc “Animal” MacYoung says, there is much more to "power generation" than hip use. Sure, the hip is important, but it isn’t everything. 25% comes from the momentum of your whole body as you lunge or step forward. So now we come to another “blind alley”; the “sine wave” theory of ITF taekwondo. As an abstract theory it seems to have some merit: General Choi noted that the body in movement (say in walking or running) follows a natural rise and fall motion much like a sine wave. Given that the momentum of your body as you lunge or step into your opponent accounts for 25 percent of your applied force, it seems to make sense to make the most of that by utilising natural body movement. On some movements you can use the “push off” from the ground to impart more force, while on others you can use the “fall” of gravity to add to force. But what is good in abstract theory falls down when you look at the context in which it is sought to be applied. The video below is a classic example: the practitioner of the form doggedly tries to apply the “rise and fall” in each movement. What you end up with is, quite frankly, a farcical mess. It is a triumph of dogma over common sense. I keep wondering when someone will shout out “the Emperor has no clothes!” If one had to show this video to someone with no martial arts background they might very easily fall over laughing. Yet all over the world thousands upon thousands of ITF practitioners labour diligently each day trying to force this “sine wave” motion into their patterns. So what’s wrong with it? For a start it suffers from the same problem as “koshi” – it disconnects movements in the pattern/kata into little distinct parcels, each one separately focusing on “power generation” while ignoring other combat needs, including that of contextual movement and flow. In this regard, I often wonder facetiously whether “sine wave” and “koshi” could be combined to produce the reductio ad absurdum of focusing on “power” at the expense of everything else. You can just imagine someone bobbing up and down while shaking his or her hips – a gyrating, pulsating train-wreck. But there is an even more profound problem with “sine wave” theory and that goes to the range in which it is sought to be applied. Yes the body does go “up and down” while running or walking. But this “rise and fall” starts to be discernible once you have travelled over 2 metres (6 feet). When you are fighting in the “melee range” the distance you travel is in the order of one metre (ie. 3 feet) or less. In the context of, say, lunging toward your opponent with a punch there simply isn’t any relevant “rise” or “fall”. Rather, you want to minimise any “rise” or “fall” tendency because you want to move in a straight line – the shortest distance between 2 points. There simply isn’t time for you to indulge in a circular path to your target. In attack you must move with the greatest economy. Indeed, one of the principles of shotokan karate (from which ITF taekwondo evolved) is to practise “level movement” – ie. to keep the same height while stepping in a low forward stance. “Sine wave” practitioners argue that this is unnatural – and indeed it might appear to be when one is stepping up and down the floor in class. But the error in the criticism lies here: In their stepping exercises, shotokan karateka are not training to cover the length of the floor. Rather each step is a separate attempt to cover the distance of one metre or so. Each step is separate training for movement in the melee. Doing steps one after the other just allows the karateka multiple opportunities to train that single, lunging step. The idea isn’t to get from one side of the dojo/dojang/kwoon as quickly as possible. It is to make each separate step as quick as possible. Think of a runner at a starting block: he or she crouches down and then blasts off with the starter gun. So far so good – the sine wave theorist would argue that the runner is “pushing up” (I would argue that he or she is pushing forward, but that is another issue). However it is what happens after the initial push off that is interesting. 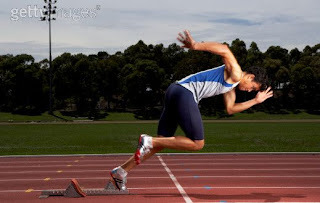 In first metre or 2 the runner takes lunging steps. It is only when the runner has passed that one or 2 metre mark that the runner rises up to a “cruising speed” where his or her gait falls into a “sine wave” pattern. Between the initial push off and the reaching “cruising speed” the runner is lunging – and staying level. I've found that if you isolate the "lunge" aspect of the initial take off, and put it into a walk, you get the low-slung walk effected by Groucho Marx in his movies. I actually use this “Groucho Marx” walking as a training tool. I get my students to do it occasionally instead of moving up and down the floor in forward stance (which is really a more formal way of doing the same thing). What I have found is that over one or 2 metres the lunge is unbeatable in terms of speed. From a standing start, you simply can’t move faster over a shorter distance. Level, lunging movement is perfect for the melee range. The "sine wave" motion of "post take off" walking or running is, on the other hand, irrelevant to this range. When there is a rise or fall in the melee, it occurs naturally as the technique you're executing requires. 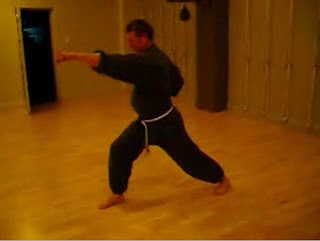 For example, you might drop into shiko dachi (horse stance) to effect a deflection or control or to absorb a push. You might rise out of a low posture to initiate a counter. But you don't "bob up and down" with every punch/strike/kick. So what has prompted this “sine wave” trend in ITF taekwondo? I think it comes right back to “faux boxing”. When you spend your time bouncing up and down, well out of melee range, I guess it makes sense to incorporate bouncing into your patterns/kata. But if this isn’t an example of “diluted knowledge” then I don’t know what is. Rather than go back to examining techniques suitable for the melee, the sine wave “development” takes workable civilian defence techniques further down a blind alley. To summarize, the melee affords you very little time. You have to move along the most direct path possible. Every movement must be contextual - ie. there because it has to be. Certainly every kata/pattern/xing has some movements where you rise and others where you drop. But you can't afford to force an artificial "rise and fall" into each kata move. As with "koshi", you can't afford to introduce extra movement just so as to "gain power"; apart from the time required to do the movement, you also "telegraph" your intention. The sine wave theory of movement is an abstract ideology that ignores these melee dynamics. It loosely fits sports taekwondo fighting/sparring where people “bounce” before engaging. But is starkly at odds with the physics of the actual engagement (which is where civilian defence should be focused). The precious time wasted, and the intention telegraphed, in artificially forcing an arc where there is no time/space for it is perhaps why you will never see a pragmatic MMA fighter “bobbing” up and down (or, for that matter, wobbling his hips) while fighting “toe to toe” in the melee. Your discussion of the "lunge" movement reminds me of a basic technique in American football. In order to deliver a powerful hit and make or break a "block" around the line of scrimmage, every lineman -- on defense or offense -- is taught to lunge this way for speed and leverage. That's why they're all crouched before the snap of the ball. Here's a picture. Right after I left that comment I found a very nifty web page on the basics of blocking and tackling in the sport. Thanks for those Matt - very apt indeed. The physics in the second web page repeats my own remarks in "Hitting harder: physics made easy" in as much as it refers to impulse. Superb.
" If one had to show this video to someone with no martial arts background they might very easily fall over laughing." It's not just non martial arts people who fall down laughing at that. It's absurd, I can hardly believe so many people deliberately practice that way. I'm very glad when I trained in TKD (ITF forms) in the 80's that our school didn't do that. This "sine wave" debate is actually a very interesting from a Taido point of view. One of our five technique classes in Taido, ungi, is based on "vertical displacement", which is essentially a wave-like motion. Here's a prime example of "ungi". However, it is not encouraged to go up or relax during this kind of movement, but to incorporate more like lunging and sinking action instead. The mental image should be "great waves crashing into rocks" as stated in the theory of our sport. This blog has proved to be an invaluable source of precise and scientific martial art knowledge. Enormous thanks! Thanks for that. Indeed, xingyi also uses a "wave like" motion. This is the very essence of pi quan. The important difference is that while one can use a rising or falling moment to aid technique, it is manifestly inefficient and costly to "load" for this by either rising or sinking. If this "load" happens contextually, then that is fine. In the case of ungi, there is a fall from level, to execute a technique and you can then rise from that to execute another technique, and so on. But this contextual "rise and fall" is very different from sine wave, as I discuss in this article. It is manifestly absurd to expect that your opponent will let you rise up (or drop down) so that only then are you in a position to execute your technique. The argument as to its role in "relaxed" movement is something I address in this article. Just read the book "A Killing Art: The Untold History of Tae Kwon Do", and I come away from it realizing that Gen. Choi wanted to have an art that was distinctly Korean, and puleld apart from its shotokan roots. I think that during the 80's, when Choi was living in North Korea, he generated the sine wave philosophy as something that is an amplification of natural movement that occurs in the tul. The result of this is followed like gospel, but adds additional movement and time to techniques that were lethal manuevers of Korean marines back in the 1950's. Yes, I believe you're right Michael. My friend Sanko feels strongly that Gen Choi was inspired by the rising and falling of taekkyon and I suspect this at least partly true. My objection is that the rising of falling action is being inappropriately laid on a karate foundation not built for that purpose. I definitely agree that some "additional movement" that is uniquely Korean was brought to what began as shotokan karate. However I feel this has already clearly evident in non-sine wave ITF, WTF, tang soo do, hapkido, etc. These arts arts use a higher centre of gravity, more kicking, some rising and falling etc. They have taken what was originally Okinawan and done something entirely unique. And on the other side of the coin, you have taekkyon - with a radically different structure and movement in almost every way. There is a reason taekkyon has completely different stances and patterns of stepping, for example. It misunderstands the mechanics and dynamics of both karate/taekwondo and taekkyon. It purports to take just one aspect of taekkyon's structure out of context and then apply this to taekwondo's karate base. In this respect I think it is a bit like tying helicopter-like rotors to a bicycle or canoe! Thanks for reading and for your contribution.